We are expert installers of everything from Twisted Pair Ethernet to fiber backbones. Whatever your needs Ohio TeleCom has the experience and equipment to build reliable network infrastructure Network Cabling Cat6a Cat 6a – We guarantee it! The Ohio TeleCom Way Ohio TeleCom believes in doing the job right. We maintain professional standards at all times. We use the highest quality parts and equipment available. We train our employees thoroughly and every wire we run is tested with professional tools. When the job is done, we make sure the job site is perfect before we leave. This allows us to guarantee all of our work. Category 6 cable, commonly referred to as Cat 6, is a standardized twisted pair cable for Ethernet and other network physical layers that is backward compatible with the Category 5/5e network cable drops and Category 3 cable standards. Compared with Cat 5 and Cat 5e, Cat 6 features more stringent specifications for crosstalk and system noise. The cable standard also specifies performance of up to 250 MHz compared to 100 MHz for Cat 5 and Cat 5e. Whereas Category 6 cable has a reduced maximum length of 55 meters when used for 10GBASE-T, Category 6A cable (or Augmented Category 6) is characterized to 500 MHz and has improved alien crosstalk characteristics, allowing 10GBASE-T to be run for the same 100 meter maximum distance as previous Ethernet variant in Dayton, Columbus and Cincinnati. Cat 6 cable can be identified by the printing on the side of the cable sheath. Cable types, connector types and cabling topologies are defined by TIA/EIA-568. 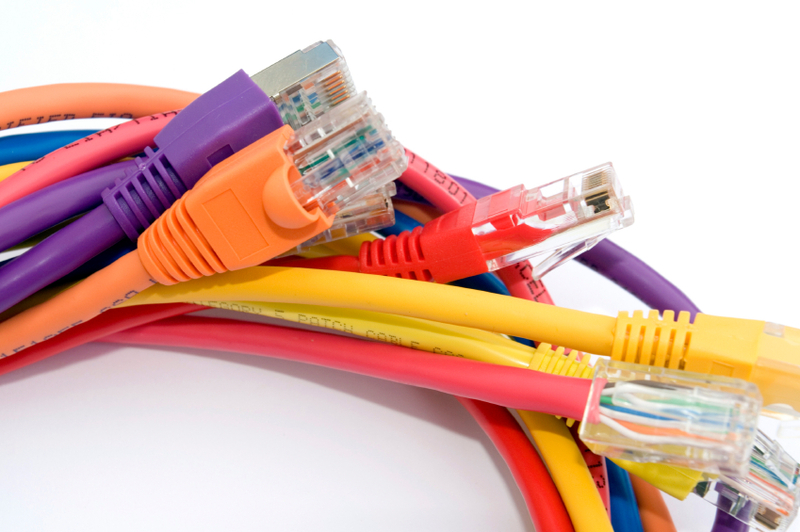 Cat 6 patch cables are normally terminated in 8P8C modular connectors. Connectors use either T568A or T568B pin assignments; performance is comparable provided both ends of a cable are terminated identically. If Cat 6 rated patch cables, jacks and connectors are not used with Cat network cable drops 6 wiring, overall performance is degraded and may not meet Cat 6 performance specifications. The standard for Category 6A is ANSI/TIA-568-C.1, defined by the TIA for enhanced performance standards for twisted pair cable systems. It was defined in 2009. Category 6A is defined at frequencies up to 500 MHz—twice that of Cat 6. Category 6A performs at improved specifications, in particular in the area of alien crosstalk as compared to Cat 6 UTP (unshielded twisted pair), which exhibited high alien noise in high frequencies in Dayton, Columbus and Cincinnati. The global cabling standard ISO/IEC 11801 has been extended by the addition of amendment 2. This amendment defines new specifications for Cat 6A components and Class EA permanent links. These new global Cat 6A/Class EA specifications require a new generation of connecting hardware offering far superior performance compared to the existing products that are based on the American TIA standard. The most important point is a performance difference between ISO/IEC and EIA/TIA component specifications for the NEXT transmission parameter. At a frequency of 500 MHz, an ISO/IEC Cat 6A connector performs 3 dB better than a Cat 6A connector that conforms with the EIA/TIA specification. 3 dB equals 50 % reduction of near-end crosstalk noise signal power; see Half-power point. When used for 10/100/1000BASE-T, the maximum allowed length of a Cat 6 cable is up to 100 meters (328 ft). This consists of 90 meters (295 ft) of solid “horizontal” cabling between the patch panel and the wall jack, plus 5 meters (16 ft) of stranded patch cable between each jack and the attached device. For 10GBASE-T, an unshielded Cat 6 cable should not exceed 55 meters. Category 6 and 6A cable must be properly installed and terminated to meet specifications. The cable must not be kinked or bent too tightly (the bend radius should be at least four times the outer diameter of the cable). The wire pairs must not be untwisted and the outer jacket must not be stripped back more than 0.5 in (12.7 mm). Cable shielding may be required in order to improve a Cat 6 cable’s in Dayton, Columbus and Cincinnati performance in high electromagnetic interference (EMI) environments. This shielding reduces the corrupting effect of EMI on the cable’s data. Shielding is typically maintained from one cable end to the other using a drain wire that runs through the cable alongside the twisted pairs. The shield’s electrical connection to the network cable drops chassis on each end is made through the jacks. The requirement for ground connections at both cable ends creates the possibility that a ground loop may result if one of the networked chassis is at different instantaneous electrical potential with respect to its mate. This undesirable situation may compel currents to flow between chassis through the network cable shield, and these currents may in turn induce detrimental noise in the signal being carried by the cable. Category 6e is not a standard, and is frequently misused because category 5 followed with 5e as an enhancement on category 5. Soon after the ratification of Cat 6, a number of manufacturers began offering cable labeled as “Category 6e”. Their intent was to suggest their offering was an upgrade to the Category 6 standard—presumably naming it after Category 5e. However, no legitimate Category 6e standard exists, and Cat 6e is not a recognized standard by the Telecommunications Industry Association. Category 7 is an ISO standard, but not a TIA standard. Cat 7 is already in place as a shielded cable solution with non-traditional connectors that are not backward-compatible with category 3 through 6A. Category 8 is the next UTP cabling offering to be backward compatible in Dayton, Columbus and Cincinnati.